Jacob wrestling – The scene was like being allowed to watch a reenactment of Jacob wrestling with what appeared to be an angel who took on the form of a man. The location was a dusty, remote, desert at night. I was part of a large crowd watching. I had the sense the angel was sent with a message. Jacob and the “man” were walking together discussing his book (or destiny – he was facing Esau the next day and had good reason to be concerned). The conversation ran its course, and the man was ready to leave, but Jacob grabbed his arm and said the negotiation wasn’t finished. The man said it was and that’s when the wrestling match started. I had the sense the angel took on the form of a man and was just playing along. In reality, he was much more powerful than Jacob and could have squashed him like a bug. However, the wrestling went on a very long time. There was grunting, and dust was flying, and they both got dirty. The audience included everyone (Father, Jesus, Holy Spirit, the seven spirits, the cloud of witnesses, the host of angels). It was like a stadium only there were viewers on the ceiling as well as the sides and balcony. Everyone was cheering for Jacob, yet they also knew who the man/angel was. It finally ended when the angel touched Jacob’s hip to end the fight and conceded the blessing because of Jacob’s persistence. I was positioned on the sideline so that as they walked together from wrestling toward the crowd, I could see Jacob more clearly; only it wasn’t Jacob, it was John limping to the sideline. And the angel wasn’t a man or an angel; it was Father, walking John to the sideline (proudly). The Wedding at Cana – The reenactment scene shifted to the wedding at Cana. I saw the crowd. I saw Jesus talking to Mary. I could see Mary from behind and saw the expression on Jesus’ face when she asked for the miracle. I could see her beauty and stature, and I could feel the respect she drew. She was very well dressed in a beautiful white gown. Jesus explained that it was not His time and wouldn’t do what she asked. Mary acted like she was in charge and blew right past the explanation. She caught the eye of servants listening to the conversation and politely told them to do whatever Jesus said, and left. This scene too was well attended, and there was cheering for Mary when she turned from the conversation. But as she walked toward us, it was Sue. Everyone was cheering for Sue. I was amazed, one of the many who celebrated and greeted her as she joined us. Wisdom took me by the hand and said, “Let’s go for a walk.” Wisdom explained the scenes. There is a shift in the Kingdom that heaven is celebrating. Spiritual warfare isn’t primarily wrestling with darkness; it’s more about sons and daughters contending for their book and the Kingdom. Father’s heart rejoices to see His sons so aware of His business and their authority, that they ‘no longer just ask.’ They speak up in the council for their book and their place. They are well aware of being chosen and there are no issues left about “self.” They are visible in the spirit even in seasons where they are hidden in the natural. They do more than volunteer for their name to be made great. They are willing to wrestle angels instead of demons. They speak things into existence by their words and their deeds. They manifest on earth what they see in heaven and their book. They carry a sense that darkness is already defeated, that they are standing up into their place and displacing the forces of darkness without another fight. They put on armor and stand against evil schemes, they quench fiery darts, but they do no fight with a defeated foe. They stand up in their calling and displace/replace them. Real sons are replacing fallen sons in this hour. Jesus won the warfare at the cross. Our evangelical roots are in sin consciousness somewhat at the expense of knowing we are created in His image and carry His desires in our hearts. Our charismatic roots have been a bit preoccupied with demons and powers and principalities which don’t need to be re-defeated. The influence that remains is primarily deception (stronghold, vain philosophies, fiery darts) but it’s not strictly at an intellectual level. For example, political ideas like socialism, global warming and identity politics can’t be defeated with logic. In the same way, we cannot just put on our spiritual boxing gloves and knock out a principality. However, we do have weapons! What we can do is stand up in our calling and shine the light of truth, the experience of love and the persistence of faith. Warfare is real, and the effects can touch our finances, health, and relationships. But our job is to stand through the storm, resist and watch it flee. We defeat evil influences by replacing them. It’s our job to occupy those seven mountains. We do pray, but we also engage and accomplish works and bear fruit. Yes, there are powers and principalities who make the nations rage, but the job of sons isn’t to fight with them, it’s to replace them, in the council and on earth. We are not hunkered down under attack waiting for rescue; we are co-laboring with a Father to start another reformation that will return nations to the King of kings. Spiritual warfare is more about contending for our book in heaven and being assertive about its implementation on earth. 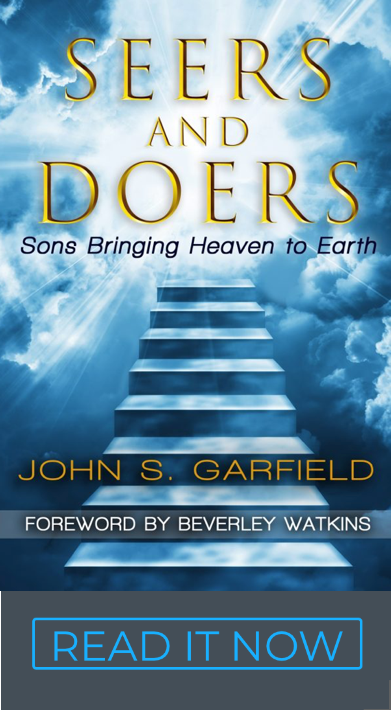 The Father loves sons who are willing to contend in heaven and on earth. Good word, John! I felt a little jealous that I was not the recipient of your vision’s application! Truly the grace of Jesus is expanding every day as we realize that allowing the Spirit of Life to bring us into a fulfillment of His promises is a practical “wrestling” and “overcoming” spiritual forces. I follow, support, and invest a lot of study and thinking about the creation/evolution debate. The heartbreak of what happens to so many believing students who attend college is testimony to the power of lies in this area; and yet I am strangely confident. My heart says that much is happening behind the visible news in this area – with almost every new scientific awareness the reality of God as creator is compounding. I proclaim loudly, with apologies to Charles Dickens and his wondrous “Christmas Carol,” the truth that is infiltrating all levels of academia, “Darwin was dead, to begin with!” Jesus’ parable of the mustard seed and leaven give me great hope. Amen ….no weapon forged against us can prosper, for it is not His will ….he created the blacksmith for His glory…. Hi John, thought I would comment here, as I couldn’t get the contact form to work on your site. Question, where do we go when we’ve had dreams about angelic encounters? I’ve had several, yet they seem far removed from practical action.. which leaves you wondering how much is just fantasy and fun dreaming. In the mean-time, months go by and they are eventually forgotten or simply turn into conversation fodder. I feel this tension a lot with spiritual conversations that bump against notions of changing our outward circumstances, yet how many of us can actually respond in a way that influences our future?